Two Dutch journalists abducted last weekend by rebels in Colombia have been released after a day of conflicting reports about their fate. Derk Bolt and Eugenio Follender were handed over to a delegation from the Colombian Ombudsman's Office, the agency confirmed in a tweet. National Liberation Army (ELN) rebels said they had freed them on Friday but later retracted the announcement. Fears were raised for peace talks between the rebels and the government. 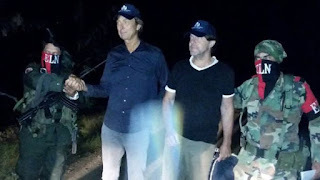 However, the Dutch pair were finally handed over in a rural area of the Catatumbo region, near the border with Venezuela. Dutch Foreign Minister Bert Koenders welcomed the release as "very good news" and thanked the Colombian authorities for having worked hard to free the men. Photos released by the Ombudsman's Office show the Dutchmen flanked by armed and masked ELN fighters before being transferred to its delegation. The Colombian Ombudsman's Office, or Defensoría del Pueblo de Colombia, is a national government agency which oversees the protection of civil and human rights.